In 2008, the Pew Charitable Trust worked with the Penn Foundation in Philadelphia to create a snapshot of historic house museums in America. What they uncovered came as a surprise to the field. In America, there are more than 15,000 historic house museums. As of December 2014, there are 14,350 McDonald’s fast food franchises in America. Only 10 percent of those house museums have an endowment to cover operating costs; 80 percent of them have more than $1 million in preservation needs, but the average operating budget is $100,000 or less. Reach Advisors, a predictive analytics firm that often works with museums, conducted a study in 2010 that found more disturbing trends. It came as no surprise that after the 2008 economic downturn, charitable giving took a steep slide. Giving is coming back up in all fields — except for museums and cultural organizations. 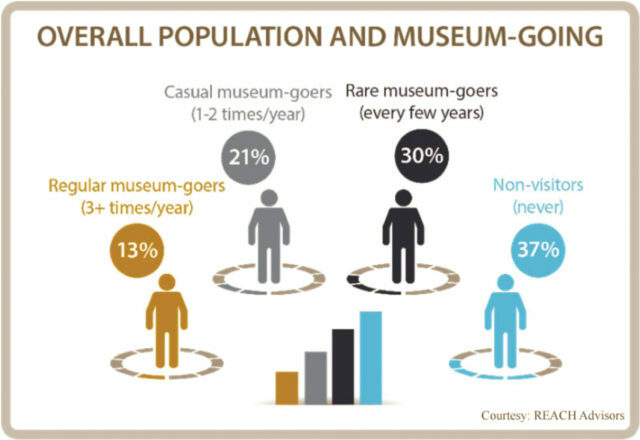 The study found that 37 percent of Americans never visit museums and that the only group of visitors that is increasing is the age-65- and-up crowd. There is a lack of connection to the present (irrelevance to the visitor’s life). Who wants to stand up for an hour while learning about a person who is presented to you as having essentially nothing in common with yourself? Many house museum tours are focused on material wealth — the best of this, the first of that (think: the wallpaper and furniture tour). Additional complaints highlighted being talked at rather than being talked to and a lack of social history or place-based history. A movement is taking hold in the historic house community that was provoked by the authors of the Anarchist Guide to Historic House Museums, Frank Vagnone and Deb Ryan. They began questioning why house museums couldn’t embrace change and offer what visitors want to experience. House museums have begun dropping the velvet ropes, discarding guided tours, embracing technology, offering behind the scenes experiences, and hosting historic happy hours with beer and history to lure new visitors. And it’s working! Hickory Hill was a proponent of the “Anarchist” way before it was a “thing.” The house rarely has ropes cordoning off the rooms. Visitors are invited to fondle the mantelpieces and push the light switches. Social history, politically incorrect history, and place-based history are all part of the stories shared with visitors, young and old. And, children regularly run amok on the grounds learning about the natural environment so loved by Watson. So the next time you visit a historic house museum, see if you can spot their “anarchist” ways!